//Devolver Digital needed a launch trailer for their new pixel platformer Broforce, and they needed an animation studio that loved Freedom, Bros, and America just as much as they did. That’s where we came in, Powerhouse Animation, known for our homegrown All-American capitalist animation. Our team created an explosive cinematic montage from Broforce’s three levels – Jungle, Cave, and Hell. 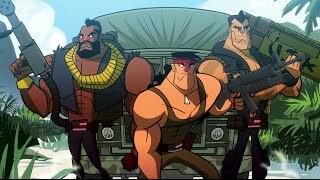 We worked with Devolver Digital to put our own spin on their classic lineup of beefed-up heroes and feature them in a traditionally animated chaotic celebration of all things Broforce. Check out Broforce – available on STEAM and Humble Bundle.